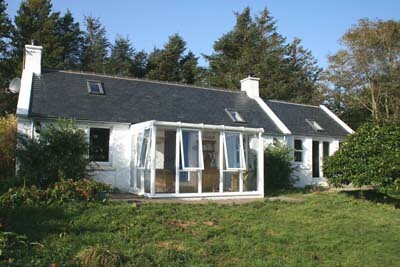 This is a fabulous house on the south west end of the Isle of Skye in an elevated position overlooking the sea loch and mountains. The area is remote and supremely beautiful. The cottage has two king-size double rooms and a twin room, all with en-suite facilities, along with a separate shower room. There is also a kitchen, and a dining room, a snug with sofa bed and a sitting room with a woodburning stove and French doors to a balcony with bench seating three and views to the harbour, on the mezzanine level. Outside, there is plenty of roadside parking available and it is just a short walk down to the harbour. 1 x ground floor twin with en-suite bath, shower over, basin and WC. First floor snug with sofa bed. Mezzanine sitting room with woodburning stove and French doors to balcony. Telephone for emergency calls and incoming calls only. Front decked balcony with bench. Shop 5 mins walk (summer months only) or 17 miles, pub 17 miles. Note: No mobile phone reception. Note: WiFi is very slow, streaming not possible. Note: There are steps to access property and throughout, may be unsuitable for guests with limited mobility. There was everything you could wish for at this property. It was just beautiful and the standard of the décor, furnishings, and cleanliness was excellent. Liked the high standards of cleanliness and the tasteful décor. It was also very well equipped with everything you need. This house ticks all the boxes; location, views, the peace and quiet, and the space and comfort. It is very very well equipped, immaculately clean and the owner and house keeper are very helpful. Look forward to staying again! This house was amazing and perfect in every way for our family spending Christmas there. The owners have thought of everything which made it very comfortable for a week. The heating, hot water, water pressure, kitchen equipment and general extras were all perfect. 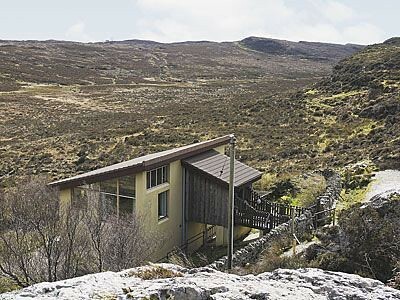 Would highly recommend any one thinking of going to Elgol to stay in this house. Thank you. An absolutely fantastic property which was spotlessly clean with wonderful facilities. In a beautiful location with stunning scenery. Nothing could be faulted about the property or location - would love to return! The whole thing as a package was fantastic, every detail was covered and the views were fantastic. A beautiful house in a beautiful position. It was very well equipped with many extra items. Askival is an absolutely amazing house of high quality throughout and the views looked just like postcards.